Acclaimed horror film Eerie continues to break records in the local box office. Over the past couple of days, Star Cinema's co-produced film with Singapore-based company Cr8 Productions has been the talk of the town for what several moviegoers refer to as "something new" in the horror genre of Philippine cinema. 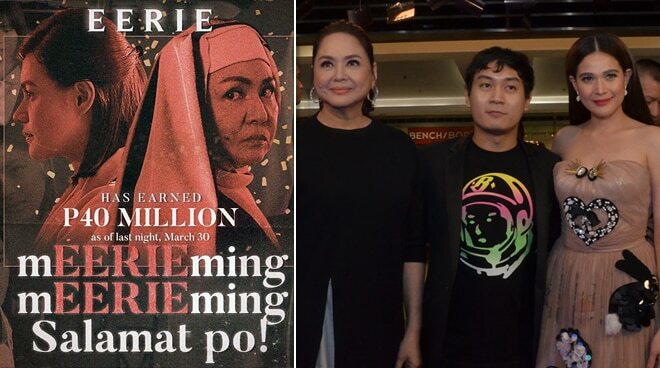 One of the testaments attributed to the success of Eerie is its evident presence in 230 cinemas and a staggering box-office earnings of 40 million pesos in just four days, Star Cinema confirmed via their social media accounts. "mEERIEmeng, mEERIEmeng salamat po sa lahat ng nanood at pinag uusapan at nanonood muli ng #EERIE," Star Cinema wrote in the caption of their social media posts. Eerie follows the story of a guidance counselor and her quest to find out the truth in the deaths of several students of an all-girls Catholic institution. Directed by young filmmaker Mikhail Red, Eerie stars Bea Alonzo and Charo Santos-Concio.